To prepare the corn: Peel the husk back, remove the silk, and rub each cob with 1 tablespoon butter and sprinkle with the salt and pepper. Replace the husk and place on a baking sheet. Bake until lightly browned, about 20 minutes. When the corn is cool enough to handle, pull back the husks and slice the kernels off the cobs into a bowl. Set aside for using in the sabayon and as a garnish. Meanwhile, to make the sabayon: Heat the oil in a medium skillet over medium heat. Add the onion and bell pepper and cook until softened, about 5 minutes. Add the garlic and cook until fragrant, about 2 minutes. Add the cream and 1 cup corn and cook over medium heat until the cream thickens and the corn is heated through, about 4 minutes. Transfer the mixture to a blender and puree. Set aside while you start the grits. 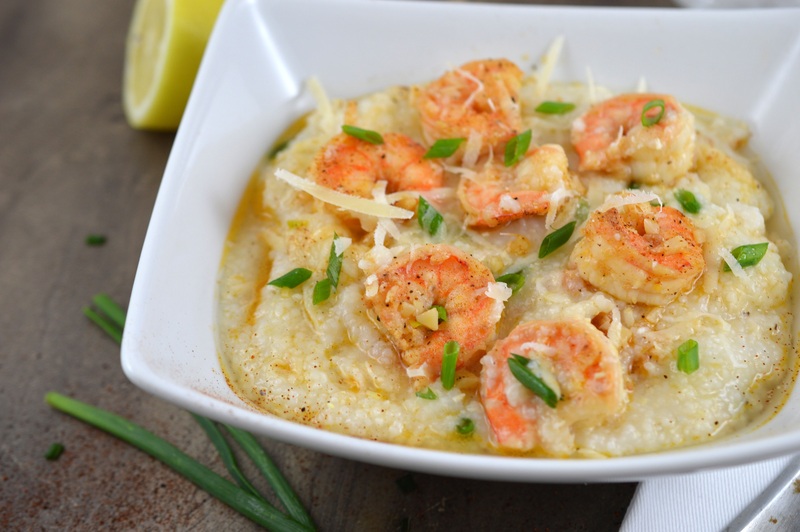 To prepare the grits, bring the water and milk to a slight boil in a medium saucepan over medium-high heat. Stir in the grits and reduce the heat to low. Cover and cook for about 25 minutes, stirring occasionally. Remove from the heat and stir in cream, butter, salt, and parmesan cheese. Cook uncovered for another 10 minutes or until tender. Add more milk to thin the grits. While the grits are cooking, finish the sabayon. Place a sieve over the top of a double boiler and strain the pureed sabayon mixture through it. Bring water to a simmer in the bottom of the double boiler. Place the strained cream mixture over the simmering water. Sprinkle in the salt. Whisk in the egg yolk and continue whisking over the simmering water until the sauce thickens, 5 to 8 minutes. The sauce should coat the back of a spoon. Remove from the heat and cover to keep warm while you cook the shrimp and sausage. To make the shrimp and sausage: Toss the shrimp with salt, black pepper, and cayenne in a bowl. Heat the oil in a medium skillet over medium-high heat. Add the shrimp and cook for 2 minutes on the first side, and 1 minute on the second side or until pink and opaque through. Transfer the shrimp to a plate. In the same skillet, cook the sausage until browned and cooked through, about 5 minutes. Remove from pan and drain on a paper towel-lined plate. Cover to keep warm. To assemble, spoon the grits in the middle of the bowl. Top with the sausage, shrimp, and some of the remaining corn. Pour the sabayon sauce around the grits. Garnish with the chives.